​ "Life Challenges in Secondary School" Tuesday, October 3- Rouleau School @ 7pm Thursday, October 5- Avonlea School @ 6:30pm This Parent/ Adult Only Session will help caregivers navigate those topics with children to assist them in making better choices. You won't want to miss this! ​The Prairie Valley School Divison has recently released the 2017-2018 School Year Calendar after being approved by the Ministry of Education. ​Please mark June 10th on your calendar as we bid farewell to the Graduating Class of 2016. Plans are well underway and we look forward to this special evening. Ceremonies start at 7:30 at the rink. ​We are excited to meet our new kindergarten class on Thursday, May 12th. 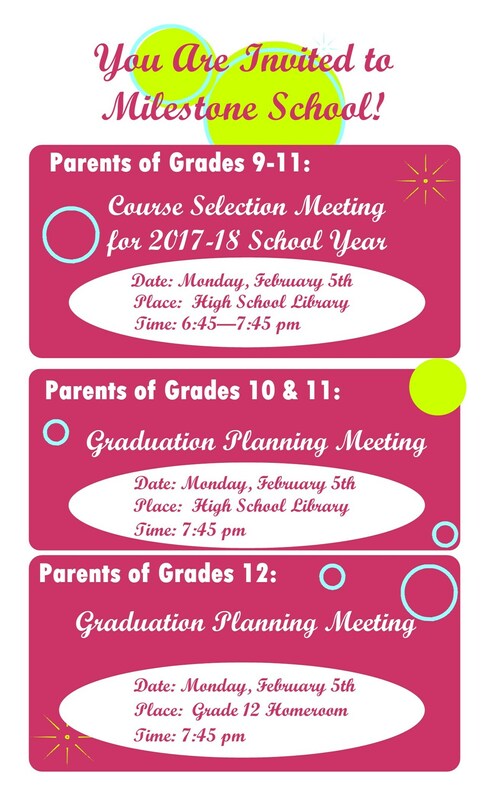 Parents and students are welcome to come to our school to meet your teacher. Please join us at 9:15-11:00 on May 12th in our kindergarten room. We cannot wait to meet you! ​We are looking forward to Fun and Fitness on June 16th this year, If the weather does not cooperate we will host theis event on June 24th. ​We are celebrating our February, March and April bithdays with a birthday assembly. Please plan to join us at 11:45 am in our elementary gym. We want to thank Mrs. Hanson, Mrs. Goldstone, Mrs. Harker, Mrs. Diekrager and Mrs. Galbraith for baking and helping us serve our pizza lunch. ​Influenza Season has started later this year and is currently active. Here are some suggested precautions: Hand washing Coughing etiquette Staying home while ill other basic hygiene practices for parents who have concerns, Healthline 811 is a good quick resource. ​Please join us on Oct. 31 and cheer on our girls as they host a volleyball tournament. Go Cougars! ​Students will be taking driver training on Sept. 13, 20, 27 and Oct. 4, 11. The sessions are on Sundays and they run from 1:30-6:30 in our high school building. ​We had a wonderful morning with our March volunteers on March 19th! Mrs. C. Beck, Mrs. Pageau, Mrs. Sjodin, Mrs. Cherian and Mrs. Kirk spent time in our grade 2 and 4 classrooms. Thanks for making yourself available to help us. ​March 13 - Zombie Day - Do you best to dress up as a zombie today. Spaghetti and meatball lunch to those students who have pre-ordered. March 17- St. Patrick's Day- Wear green today. March 26-Rainbow Day- Wear as many colours of the rainbow as possible at once! Wear an outfit that matches a pair, dress as a Disney pair or wear your favorite Valentine Day colours. ​On Wednesday January 21, we will be having a pj and waffle day. This day was made possible because of our successful magazine sales. Dress up in your pajamas and come for breakfast in the morning. ​On Thursday, January 15, 2015 we will be having a superhero day! So make sure your child comes to school dressed up in their best superhero costime. If you don't have a superhero costume have no fear! A towel or blanket cape will do. 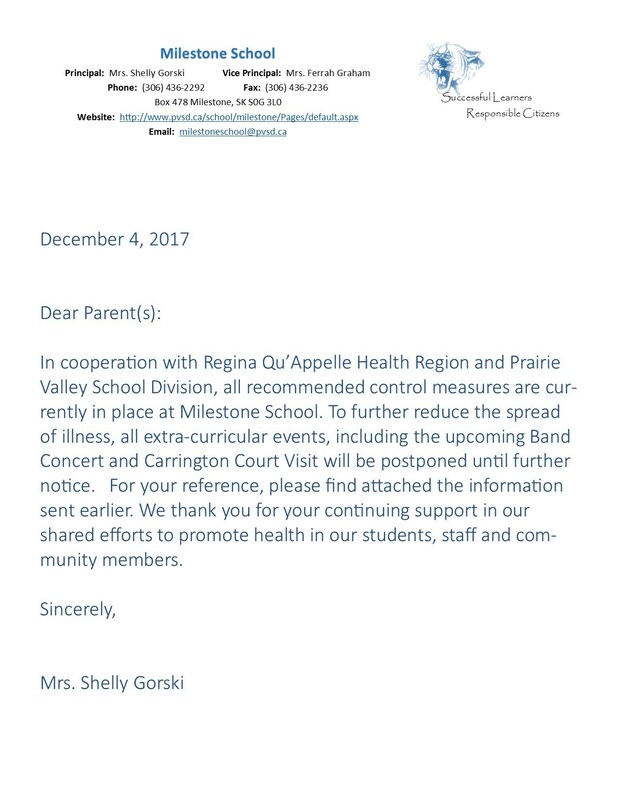 ​The Grade 4's visit on Dec. 12 to Carrington Court has been postponed. The students are looking forward to their visit on Dec. 15. ​Good luck to our Senior A Girl's Volleyball Team who travel to Strasbourg on Saturday for Regionals! ​The grade 4 class are excited about spending sometime at Carrington Court again this year. They will be celebrating Thanksgiving by discussing how harvest time has changed over the years. ​Please join us on September 26 for another great football game and barbeque. Come cheer on our team at 4:00. ​A multi-denominational church service in honor of the Milestone Graduating Class of 2015 will be held at The Milestone Alliance Church on Monday, May 25 at 7:00 pm . Please show them your support on this day. Pastor Robert Thompson will once again be speaking to the graduates! ​Please join us on April 30 in the elementary gym @ 11:45 as we host another birthday assembly. We will be recognizing students born in February, March and April. A pizza lunch is planned for the students on that day. ​Teachers are once again looking forward to connecting with you to discuss your child's progess at our annual conferences. Interview will take place on April 2 & 3 from 4 :00-8:30 PM. ​We invite all community members to our Annual Meeting of Electors, which will take place on Jan. 22, 2014 at Robert Southey School at 7:15 p.m.
​Thank you to everyone who came out and supported the book fair. Your generosity enabled us to add $1200.00 of new books to our school libraries. Your committment to this initative is so appreciated. ​Be sure to mark your calendar for Dec. 19 at 7:00 for our Christmas Concert. The students will be presenting a wonderful play and music for you. This concert continues to be a crowd favorite for so many in our community. ​Please join us on Dec. 10 for a wonderful evening of music by our band students. This concert will start at 7:30 in our high school gym. ​Grade 5-10 students have been very busy preparing for their drama production. Pleas join us on Dec. 12 at 7:00 p.m. for a great evening. ​We are so proud of our senior girl's volleyball team who advance to regionals in Watrous this Saturday. We are very proud of your hard work this year and we wish you well. ​Please join as we celebrate our football season on Friday, November 15 at The Masonic Hall. Advance tickets are available at Milestone Affinity Credit Union. The evening starts at 7:00 PM. ​Please join the students and Stand of Milestone School for our annual Remembrance Day Service @ 10:45 am in our high school gym. Parents and members of our community are always welcome. ​Our bus drivers deserve a high five for their commitment to our Milestone School students. Thanks for taking such great care of our students while getting them safely to school and home each and every day. You do a wonderful job! ​Please have a look at the attached file for information about school fees. The fees for Band, PAA, PE, Trips, Team Fee, Visual Art and Photograpy are posted. Please make your cheques payable to Milestone School We really appreciate these fees being paid in a timely manner. COURSE SELECTION SURVEY - GR 9-11!